Peter Feldman: Auto & General Theatre on the Square in Sandton is best known perhaps for staging many illuminating plays – but it also promotes live music. An excellent new production, Christine & The Kilts, up from Cape Town, commands the stage at this intimate venue until 29 September and they are well worth a visit. It’s been a long time since I found myself totally immersed in a feast of Celtic songs superbly brought about by singer, songwriter and actress Christine Weir and her merry little five-piece group, all clad in various tartan gear. There is even an Afro twist to the musical proceedings, thanks to the input of diminutive Skhumbuzo Qamata, who adds some flourishing touches. The Kilts also comprise Christine’s son, Matthew, on guitar; corpulent Leon Oosthuizen, a whiz on traditional Celtic accordion; acoustic guitarist Duncan Robinson; and Rayelle Goodman, an amazing violinist whose energy and style ooze from the stage and sets the tone for most of the compositions. Christine, best remembered for the audacious “Not the Midnight Mass” with husband Graham, which ran successfully for over 25 years, is the leader, raconteur and focus of the band. Not only does she sing with haunting intensity, but a couple of her own compositions touched the soul with their inspiringly beautiful lyrics and musical structures. The beauty of the show is that the musicians accompany the singer with such skill that they never overshadow her, thus allowing her vocals to shine through on some elegantly-woven imagery. Christine has focused her life on Scottish music and her outlet for this is her band. They have already produced a CD and their musical spin is beginning to gain much traction. What I also enjoyed about this presentation, apart from Fiona Du Plooy’s appealing staging, is Christine’s storytelling prowess. She has studied the Celtic genre and her knowledge and understanding of the many traditional songs performed made the experience so much more pleasurable. Each song had a history and the stories were told with conviction, not merely someone sticking rigidly to a script. It all came from the heart. Apart from familiar numbers such as a splendid rendition of Danny Boy and Mull of Kintyre, Christine mines some incredibly evocative material, one being a mournful song written by James McPherson, a Scottish cattle thief, condemned to death. The lyrics constitute his last thoughts and the noted Scottish bard, Robbie Burns, added a couple of lines of his own to the song. Other numbers in the repertoire include the “Dowie Dens of Yarrow,” “Bonnie Prince Charlie,” a song concerning the slaying of the McDonald clan, and Christine’s own composition, “Warriors Cry,” about brave Scottish soldiers taking on the British forces in their birthday suits. Another highpoint was an a cappella number in a style called Scottish mouth music. Overall, Christine and the Kilts is a refreshingly uplifting, highly professional and most enjoyable trip to the theatre – and lucky audience members even get a chance to win prizes. 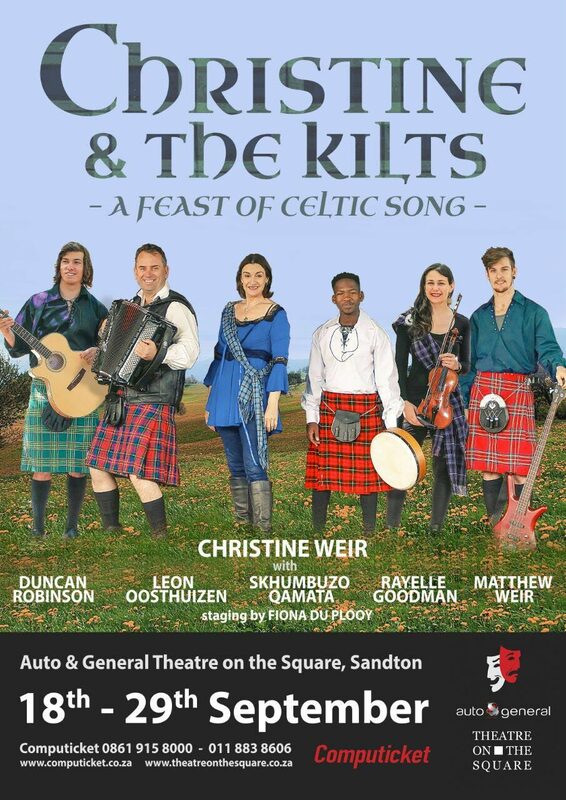 Christine & The Kilts are on at Auto & General Theatre on the Square, Sandton, until 29 September. Peter Feldman has been a journalist and arts critic for almost 50 years and served on The Star in various capacities for 35 years, ending up as a specialist writer on films, music and theatre. During that time, he travelled extensively on assignments and interviewed many international film and pop stars, both in South Africa and overseas. He also covered some of South Africa’s biggest film and musical events. He was one of only two South African journalists to be invited by Steven Spielberg to the Hook film junket in LA in 1991 where he interviewed the famous director as well as Dustin Hoffman and the late Robin Williams. He attended the gala James Bond premiere in London in 1981 and did an iconic interview in a Rolls Royce with Roger Moore who played Bond. He spent a week touring England with Queen prior to their Sun City visit in 1983, interviewed a host of international stars on films sets in Hollywood and London and was the first local journalist to nail an interview with The Rolling Stones prior to their SA visit in 1995.